A leading south of Scotland farmer has voiced "extreme concern" after a deadly cattle disease was found in wildlife across the border in Cumbria. 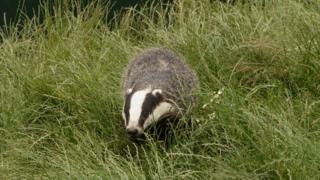 Bovine TB has been discovered in badgers in the region for the first time in about 30 years. Scotland has been classed as officially free of the disease since 2009. Lockerbie farmer Robin Spence said the industry remained vigilant but they relied on the authorities to prevent TB returning north of the border. The Animal and Plant Health Agency (ALPHA) made the latest discovery in the Ship area while investigating 16 cases of the disease in cattle in east Cumbria. Cattle movement restrictions are in place and further investigations are under way. Mr Spence said the situation would be watched closely by farmers in the south of Scotland. "This is of extreme concern, especially given the area from Scotland to this TB outbreak and the infected badgers is an area that is full of livestock," he said. "It is not an area where there is a great urban conurbation or great areas of arable which are keeping the disease from spreading up towards us. "Cumbria's a very, very rich livestock area akin to Dumfries and Galloway - it is a mirror image of here - so we are very concerned."